Atlantis is a city that has a perfect location in Palm Beach County Florida that spans 834 acres. The community is ideal for year-round and seasonal residents. Atlantis Real Estate is a perfect blend of approximately 1,200 properties; which include a blend of villas, townhomes, condominiums and single family homes. There really is something for almost anyone on any budget. Atlantis is also a small, gated city that features its own police department. Search all homes for sale just like an agent. Our free, one-step registration allows you to bookmark your favorite houses, save searches and receive emails as soon as new homes in Atlantis come on the market. Those that love golf, nature and the Florida charm will enjoy the variety that homes in Atlantis have to offer residents. The beautifully landscaped community also has two city parks and two country clubs. There are 45 holes of championship golf! The community is also home to Palm Beach County's largest medical center, JFK. The city is close to Palm Beach State College, the Palm Beach International Airport and both I-95 and the Florida Turnpike. 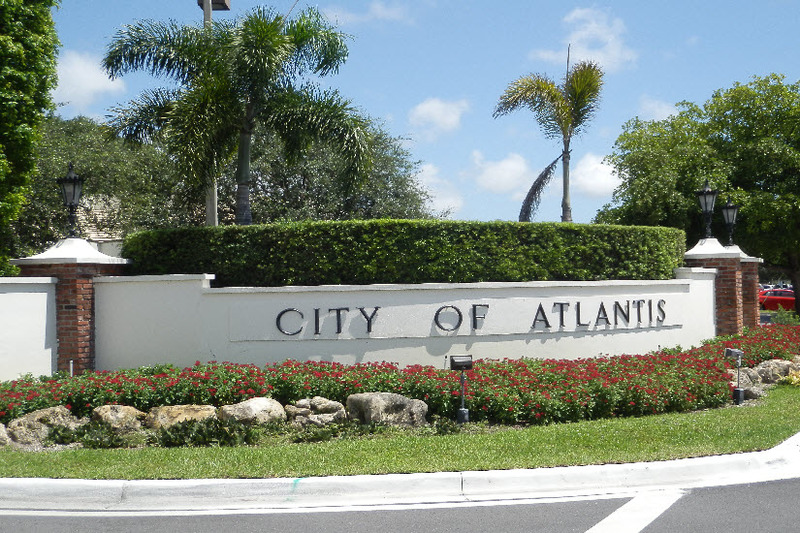 The City of Atlantis is located one mile west of I-95 on Lantana Road and just North on Congress Avenue. The golf course consists of 18 holes. It features four sets of tees, two putting greens, a driving range and sand bunkers. The Atlantis Country Club is well-manicured. The golf course is open to the public. There is even a snack bar that is located between the two nines. When you are ready to unwind, visit the clubhouse lounge. This club has been private since 1972. There is a maximum of 350 playing members. The Atlantis Golf Club offers a full service clubhouse, PGA teaching pros, a large, practice facility, and many tournaments & events. The club has 27 golf holes on 6,700 yards. There are three, nine-hole courses and four sets of tees. The City of Atlantis features the Garden Room and the Palm Room for dining. The Palm Room offers continental cuisine. If you are looking for a place ideal for a private party you can use the Palm Room.